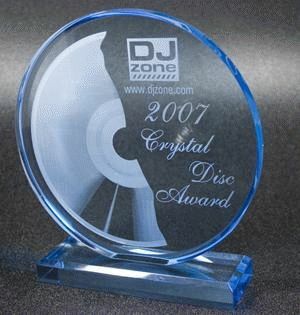 DJZone.com, the Web’s largest information network for disc jockeys, today announced the recipient of their 2007 Crystal Disc Award for lighting. The award is given annually to a lighting manufacturer whose product exhibits superior technical innovation for the mobile and club disc jockey industries. DJZone’s 2007 Crystal Disc for Lighting was awarded to Chuck Davies, Scott Davies, Toby Velazquez, Alfred Gonzales of American DJ for their Revo Series of LED Lighting. 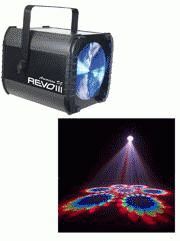 Going the extra mile to provide DJs with an affordable yet vibrant solution to adding LED lighting to their shows, the Revo Series produces stunning multi-beams of light that rivals conventional halogen lighting units. “Side by side comparison with comparable lighting units allowed the American DJ Revo Series to take the award hands down”, Says Sid Vanderpool DJzone CEO, “I can’t see DJs not wanting to upgrade to LED lighting after they see the Revo Series”. Disc jockey industry leaders and nearly 70,000 registered members of the DJZone network of websites make nominations for DJZone.com’s annual Crystal Disc.